WhatsApp is one of the most popular and great instant messaging app around with a number of features including both video and audio calls. Most people use it every single day because it’s convenient and just works. There is however one feature that has been missing for a while and that is call recording. Of course, there is a major concern of surveillance and misuse with call recordings, but sometimes we desperately need it. If you want to record WhatsApp calls there are a few workarounds, but it’s not full-proof as it also depends on the smartphone you are using. That being said, this is your best bet right now. So, here is how you can record WhatsApp calls on Android and iPhone. Note: Make sure that you are not breaching privacy or law of the land by secretly recording calls. You should take informed consent from the callee prior to the recording. Since WhatsApp call recording process is different for Android and iOS devices, we have created separate sections. Feel free to skip to the section that you want to read. WhatsApp call recording doesn’t work on every Android device. Some devices have VoIP call recording enabled and some don’t. Go through this updated list and check if your device is mentioned there. If you don’t want to go through the list, just follow the steps and you will know if your phone is supported or not. Also note that devices running on Android Pie may prevent the recording due to restrictions at the OS level. Step 1. Install Cube Call Recorder app (free, in-app purchases) and open it. Grant all the necessary permissions and you are good to go. Step 2. 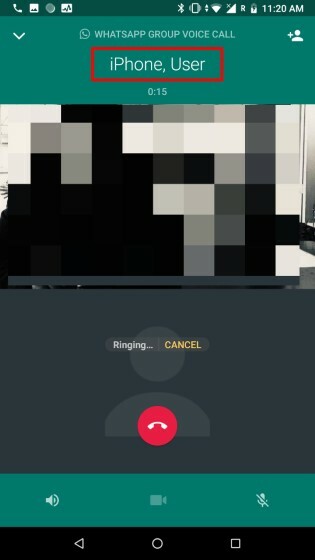 Now, open WhatsApp and make a call, a widget should appear on your screen indicating it’s recording your WhatsApp call. If the widget doesn’t appear then manually tap on the microphone icon in the Cube Recorder app. It will start recording your call thereafter. Step 3. In some cases the recordings don’t have audio from the other side. To fix this issue, tap on the hamburger menu and open “Recording”. Change VoIP recording audio source to Microphone. Note that it will turn on the loudspeaker as well. Besides WhatsApp calls, you can use this app to record cellular calls as well. In our testing, WhatsApp call recording worked flawlessly, both on Mi A1 and Redmi Note 6 Pro, without changing the default settings. iOS is pretty strict when it comes to privacy, so there is no easy way to record calls be it WhatsApp calls or cellular. However, there is a hack which accomplishes the task but it takes a lot of work. It’s a tedious process where you will need a Mac, an iPhone, and a secondary smartphone with WhatsApp account. The secondary device can be either Android or iPhone. We need a secondary device as your primary device will remain connected to your Mac for recording. Step 1. Connect your iPhone to Mac and give necessary permissions. Now, open QuickTime and click on the File menu. Here, choose “New Audio Recording”, select your iPhone as the source, and click on the record button. Step 2. From your iPhone, make a WhatsApp call to your secondary WhatsApp device. Once connected, use the WhatsApp’s group calling feature to add the person you want to talk to. Step 3. Now continue the conversation using the secondary device. After you are done with the conversation, stop the recording on Quicktime and save it on your Mac. Note: Keep the iPhone connected to the Mac all through the conversation. Also, all three WhatsApp numbers should be active in the group call. Disconnection of any of the device will prevent the recording. That’s it, I hope that this tutorial was able to help you record your voice calls on WhatsApp. If you want to learn more about the popular chatting application, you can read our WhatsApp tips article where we share many tips and tricks to help you get the most out it. As you can see it is not easy to record WhatsApp calls. With the ongoing tighter privacy controls, we can only assume that it is going to be even harder in the future. iOS already makes it next to impossible to record calls and Android is slowly moving in the same direction. Let us know if you were able to use our methods to record WhatsApp calls or not. Also, what do you feel about these new privacy standards which are preventing users from recording your calls? Drop your thoughts in the comments section below.